When a family of four searched for a home in the North Shore area of Sydney, Australia, they ended up falling in love with a garden. The lush, leafy display belonged to a bungalow that had charm, but it needed modifications to meet the family's vision: namely, an open layout and a kitchen fit for entertaining. So, with the greenery in mind, the family brought on the help of Architect Prineas to tend to their dream address on the same plot of land. 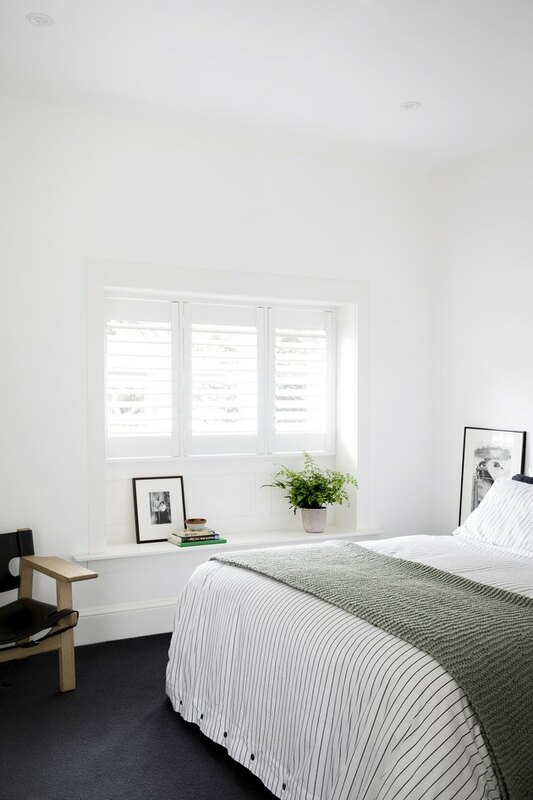 "The project sought to re-work the footprint of the existing 1930s Californian bungalow, without compromising the character," architect Eva-Marie Prineas said. 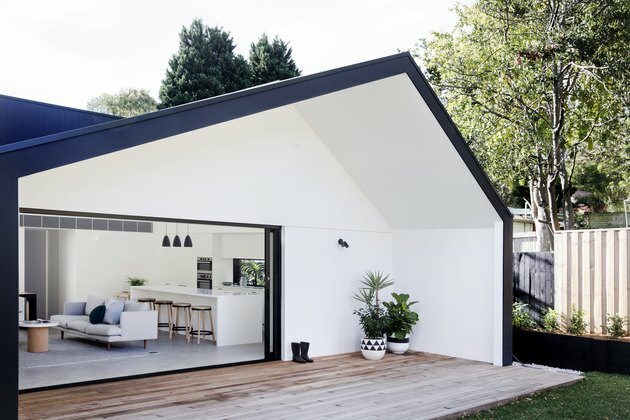 To give the owners more space without disrupting much of the original site — or upending their tight budget — Prineas and her team focused on a rear addition that resembled a shed-like structure. Its double-height ceilings and geometric windows bring in light and views of outside, while its expansive living space opens on to the garden they first admired. It's the exact connection to the outdoors they wanted. The addition's living area was constructed through a combination of modules set on a grid system. 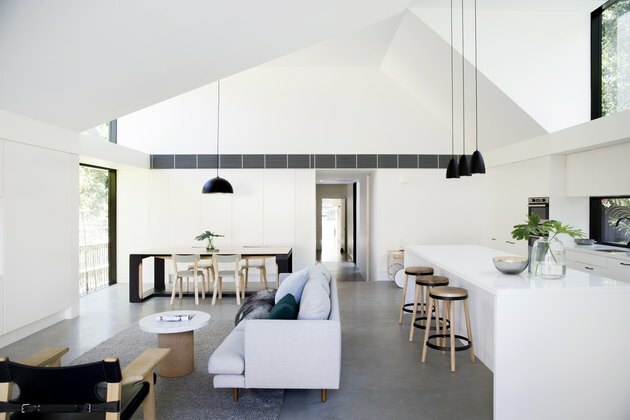 A double-height roof and dormer windows open up the space to light. 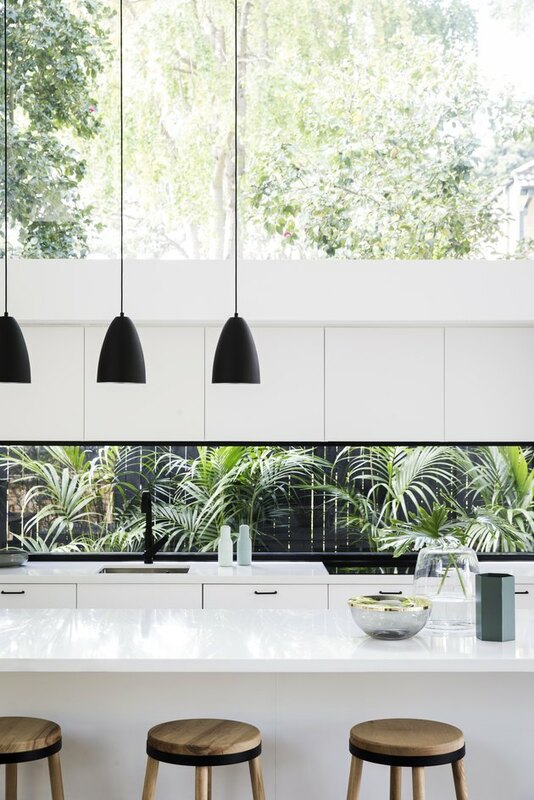 Ikea cabinetry is topped with Caesarstone in the kitchen, but instead of a traditional backsplash, a long window ushers in light and views of the greenery. 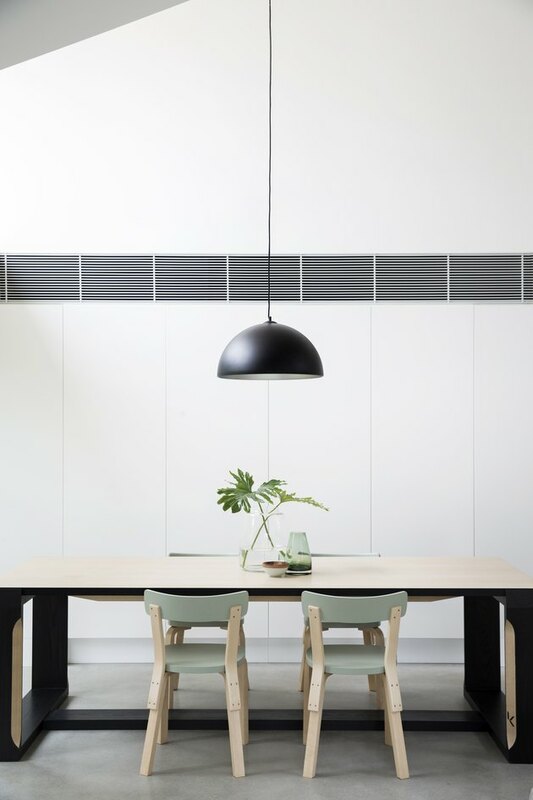 Wooden chairs soften the industrial appearance of the home's concrete slab flooring in the dining area. 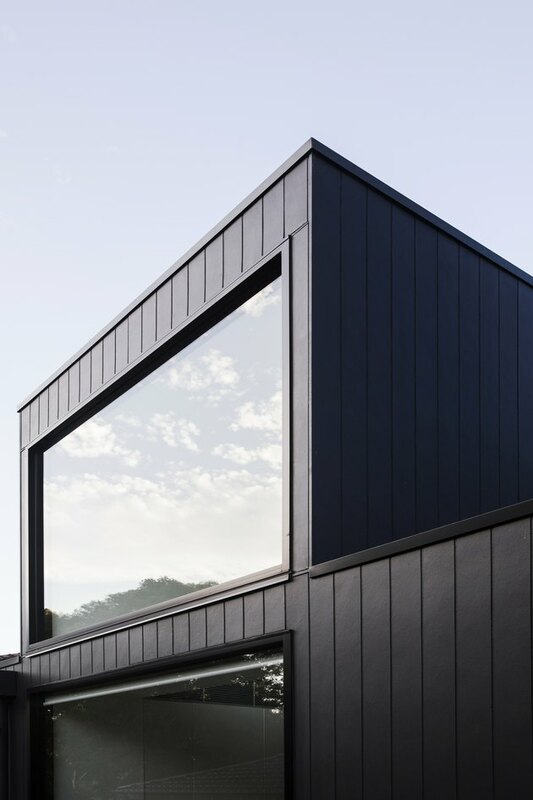 Throughout the home, black aluminum windows offset crisp white walls and connect the space with its natural surroundings. Concrete floors were selected with thermal efficiency in mind. 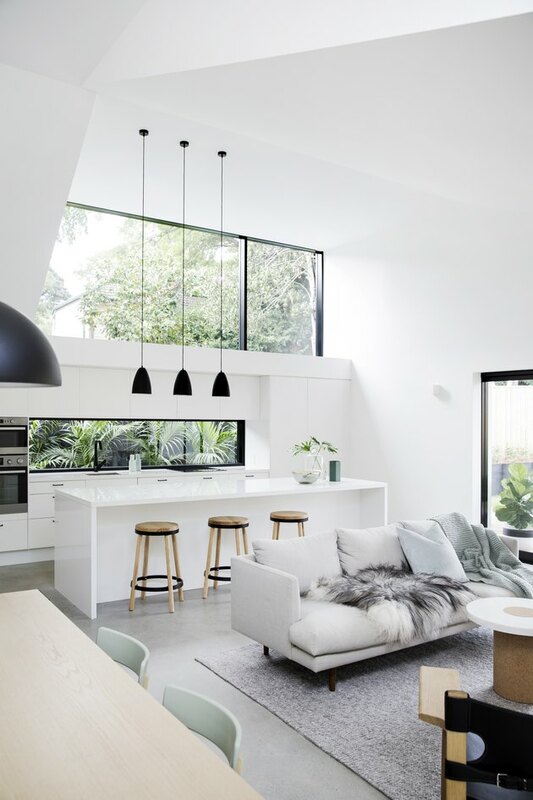 Natural light floods this airy, minimalistic retreat primed for relaxation. In the bathroom, floating sinks by Caroma are punctuated by Rogerseller taps. White matte Better Tiles cover the walls behind Ikea vanity, while a towel rail from Madinoz stands nearby. 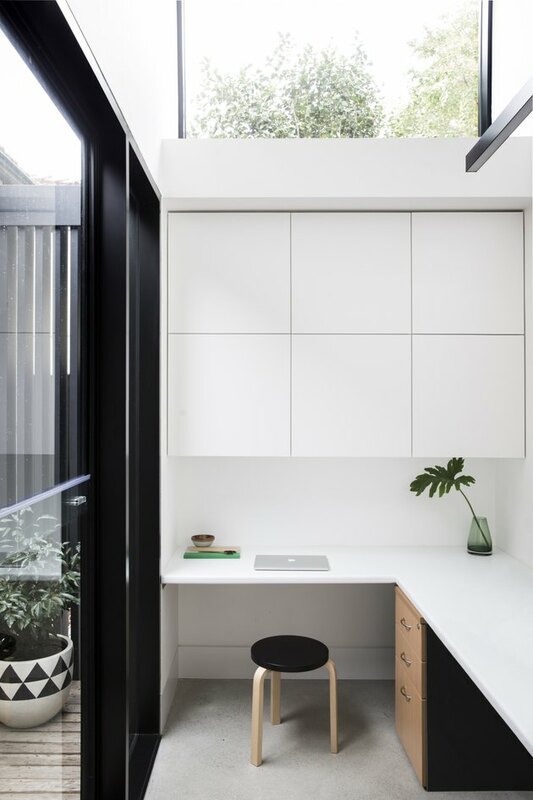 This minimalistic workspace comes with extra light and exterior views, courtesy of the glazed link to the home's addition. The addition opens up to outdoor space that the family loves. A timber deck connects the home's indoor and outdoor entertaining spaces. The large windows of the addition usher in light that give the home its open feel.